Founded in 2013 by a couple of friends in Amsterdam, Pig & Hen create handmade bracelets using the finest materials and techniques. Handmade is a term that's thrown around a bit too abundantly nowadays, but the craftsmen at Pig & Hen aren't using it in vain: each bracelet is crafted to a very high standard with meticulous attention to detail. The materials used will last you a lifetime and colours won't fade over time. Please have a look at the size guide to make sure you get the preferred fit. Use a tape measure to check your wrist size. 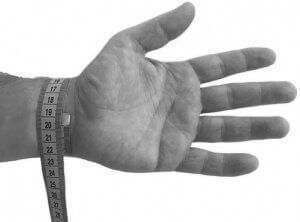 The sizes below are the circumference of your wrist.